Abstract: In this Beginners Guide PCSTATS aims to give you a basic visual acquaintance with the various ports and connectors on your PC, and a general understanding of what they are and how they work, hopefully bridging a circuit between the jargon and your hands-on knowledge of your own computer. Parallel (printer) port: A 25 pin connector used with printers and communication cables primarily. Used initially for devices and applications that required faster data transfer than serial ports could provide, the parallel port is on its way out now due to the success of USB connectors. Over the years, several different modes have been developed for transferring data through the port, including standard (SPP), enhanced (EPP) and extended capabilities (ECP). All modern motherboards are capable of any of these modes. The parallel port should be plugged and unplugged with the computer powered off. Serial Port: An early form of external connector, still in use today, though becoming less common. Used to connect a variety of devices, including mice, modems and communications cables. Generally take the form of a 9-pin male connector (DB-9) but may also be found as a 25-pin male connector (DB-25). In terms of data transfer rates, serial ports are the slowest external port, generally topping off at 19.2Kbps. There are multiple standards for serial port communications, the most common being RS-232 and the newer RS-422. Analog Video Connector: A sort of catchall term for the connector you plug your monitor into on the computer. A 15 pin female connector, VGA stands for Video Graphics Array, and is the baseline standard for PCs to display images on a screen. Technically, the VGA standard only covers displaying images at a 640x480 resolution, but different companies have instituted a variety of different naming schemes for displaying resolution above this. VGA remains the default standard, so it is used as an identifier. Generally, the VGA connector will be on a graphics adaptor connected to the motherboard, but it may well be integrated into the board also. VGA cables can be safely plugged and unplugged while the computer is running. 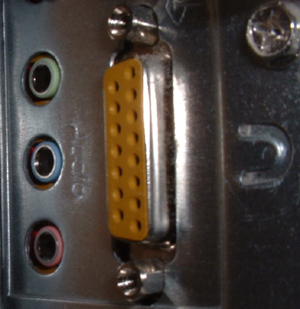 Some graphics adaptors have more than one VGA connector, enabling the use of multiple monitors. Audio Connectors: Connectors built into an expansion card or the motherboard itself that allow audio input and output. Generally speaking, any computer will have three audio connectors, audio-in, audio-out and mic-in. These use the same 3.5mm stereo plugs that most home audio devices use. Depending on the device, there may be more than one audio-out connector for multiple channel sound. Though the colour coding can vary, it is generally accepted that audio-out connectors are green or black, mic-in ones are pink, and audio-in blue. All audio cables can be plugged and unplugged without damage to a running computer. Joystick Port: Another throwback to older computer designs, the Joystick port is a 15 pin female connector that is traditionally attached to sound cards, but may also be integrated into the motherboard. It's only function is to allow the use of joysticks and game pads in computer games, and as you might guess, it is also close to extinction due to the fact that most gaming devices now come with USB connectors. Most soundcard manufacturers have stopped adding joystick ports to their products. Ethernet port (RJ45, network card): These ports, either built into a network adaptor or attached directly to the motherboard, allow computers to communicate with other computers and devices such as network hubs in a local network or over the Internet. They use category 5 (cat-5) network cable, and the Ethernet architecture. For more information on how Ethernet works, and on networking in general see our introduction to home networking Beginners Guide (see: Home Networking Guide). There are several standards for the speed at which these ports can carry data. The most common are the 10base-T and 100base-T standards, which provide for data transfer speeds of 10mbps and 100mbps respectively, and are cross compatible (though the speed will be limited by the slowest device). Ethernet ports come in two varieties, straight wired and cross-wired, just as the cat5 cable comes in straight through and crossover types. Straight wired ports (your computer's Ethernet port, for example.) need straight through cable to connect to cross-wired ports (Hubs, cable modems, etc.) and cross-wired cable to connect to other straight-wired ports. Cross-wired ports are usually marked with an (x) next to the port. Pg 3. Firewire, PCI, Videocard, CPU, etc. Pg 4. Motherboad connectors continued.